May also be danced as a 6x32 medley - 3x32 strathspey followed by 3x32 reel. 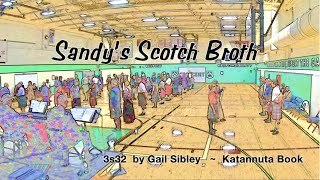 This dance is dedicated to my friend Sandy Gordon with whom I enjoy drinking good scotch. We both take great lpeasure in dancing strathspeys and so I wrote this dance for him. The first time the club danced it, it was without a title and when the club member Catherine Bennett said the movement of the dance reminded her of scotch broth I thought it fit perfectly as a title. 27-30 who promenade 1/2 way clockwise while middle people (2M + 3L) turn LH 1.1/2. Added on: Oct. 22, 2012, 5:17 p.m.
Added on: April 17, 2019, 1:49 a.m.
Budapest Local Club 03.12.2015 2015-12-03 Zsofia Jozsef Dec. 4, 2015, 12:22 a.m.
Sheffield ~ 170918 Dancing 2017-09-18 James Wilson Sept. 19, 2017, 2:24 p.m.
Oldenburg 2014-01-20 2014-01-20 Martin McWilliam Jan. 26, 2014, 3:20 p.m.
Oldenburg 2014-02-17 2014-02-17 Martin McWilliam March 10, 2014, 5:03 p.m.
Scottish Flowers Hildesheim 2014-07-14 2014-07-14 Cord Walter July 14, 2014, 11:27 p.m.
SF Hildesheim Auftritt - Magdalenenfest 2017 2017-06-11 Cord Walter May 6, 2018, 10:05 p.m.
Scottish Flowers Hildesheim 2017-05-15 2017-05-15 Cord Walter May 15, 2017, 10:01 p.m.
Scottish Flowers Hildesheim 2017-05-29 2017-05-29 Cord Walter May 29, 2017, 11:11 p.m.
Scottish Flowers Hildesheim 2014-09-15 2014-09-15 Cord Walter Sept. 15, 2014, 10:36 p.m.
Scottish Flowers Hildesheim 2015-03-16 2015-03-16 Cord Walter March 16, 2015, 11:35 p.m.
Scottish Flowers Hildesheim 2017-05-08 2017-05-08 Cord Walter May 8, 2017, 11:21 p.m.
Scottish Flowers Hildesheim 2015-11-16 2015-11-16 Cord Walter Nov. 16, 2015, 10:05 p.m.
Scottish Flowers Hildesheim 2018-09-10 2018-09-10 Cord Walter Sept. 10, 2018, 10:59 p.m.
Scottish Flowers Hildesheim 2017-05-22 2017-05-22 Cord Walter May 22, 2017, 10:59 p.m.
Scottish Flowers Hildesheim 2018-03-12 2018-03-12 Cord Walter March 12, 2018, 10:36 p.m.
Scottish Flowers Hildesheim 2017-04-24 2017-04-24 Cord Walter April 24, 2017, 11:12 p.m.
160516 The More Unusual Dance Club 2016-05-16 Peter Dixon Oct. 18, 2016, 5:11 p.m.
150720 The More Unusual Dance Club 2015-07-20 Peter Dixon Nov. 24, 2016, 4:52 p.m.